Making a decision about your eyewear goes well beyond just receiving good vision, you are also making a statement about who you are. Your decision affects how you see and also how you want to be seen by others. But with so many different styles to choose from, getting your desired look can sometimes be quite overwhelming. Click here to learn the 7 reasons to buy from us! At all three of our locations, we have an experienced optical staff ready to help you with your specific needs and explain how different lenses and frames best fit your personal lifestyle. 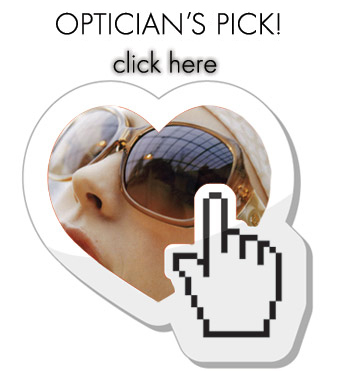 We can find the look, fit and functionality you want from your eyewear. What lens treatments do you offer? Today's lens treatments are not like the ones from yesteryear. Today they are infused into the lens. There is no peeling, or oil on water kind of appearance. 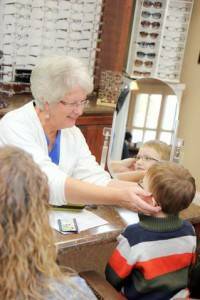 We offer anti-glare, anti-glare with a blue light filter, anti-scratch and transitions lenses. About 80% of all the lenses we make have an anti-glare lens treatment. The reason we have such a high average is due to how well they work. They eliminate glare and if there is a scratch, chip or any defect in the lens, it will get remade for you. We offer Crizal anti-glare lenses. All our Crizal lenses have a 2-year warranty on them. We use a standard anti-glare called Crizal Avance anti-glare which eliminates strong illumination of glare, and we also offer Crizal Prevencia which eliminates all of the strong illumination of glare and also the harmful blue-light we get from computers, electronics, digital devices, energy-efficient lightbulbs and even sunlight. That's what makes the sky look blue. In addition, we also offer an anti-scratch treatment. This is a basic anti-scratch called TD-2 that has a two-sided coating. There is no optical value to it, it just makes the lens tougher, and we have a warranty if you get a nick or scratch on it. This is great for kids glasses. In addition, we also highly recommend the Crizal Prevencia for all kids because of how much time they spend on digital devices nowadays, at school and at home. All of our patients who tried the lens treatments never purchased a pair of glasses without it ever again. With over 3,000 frames to choose from, we offer one of the area's largest selections of glasses, custom lenses and sunglasses. We have options that will fit any budget, from our Value Packages, to the latest fashion forward designer frames in a variety of styles, colors and materials including titanium, stainless steel and plastic. Along with our large frame selection, our staff can help you choose specific lenses to match your needs and lifestyle. We offer the most advanced digitally-surfaced lenses to give you the best vision possible. We also offer transition lenses as well as other specialty lens treatments (such as UV protection, polarized, anti-reflective, scratch-resistant, and computer lenses). What do you recommend for children's lenses? We also offer a selection of frames and lenses for safety glasses (at work and for children), hunting and other sporting eyewear. For selected lenses, we have an in-house laboratory equipped to cut your lenses while you wait. What do you recommend for people who play sports? We highly recommend Rec-Specs sports glasses. These are the best, and we sell a lot of them to sports enthusiasts. They are great because they are made with a polycarbonate unbreakable lens, and a frame and strap more conducive to sports so they will stay on, fit snugly, and are more durable. Whether you are a patient of ours, or you are bringing a current prescription from elsewhere, we welcome you to visit our optical showrooms to view our selections - no appointment necessary.